Starwood Hotels & Resorts Worldwide, Inc. (NYSE:HOT) today announced it has entered into a franchise agreement with Brighton and Hove Albion to open a new Aloft hotel in the popular southern England coastal city. Starwood Hotels & Resorts Worldwide, Inc. (NYSE:HOT) today announced it has entered into a franchise agreement with Brighton and Hove Albion to open a new Aloft hotel in the popular southern England coastal city. The 150-room Aloft Brighton, which is due to open in September 2017, will expand the brand's growing footprint to four hotels in the UK, including two in London (Aloft London Tobacco Dock opens 2018), one in Liverpool and now one in Brighton. "This agreement illustrates the strong demand for stylish, yet affordable accommodation in mature and strategically important cities such as Brighton," said Michael Wale, President, Starwood Hotels & Resorts, Europe, Africa and Middle East. "We are delighted to partner with Brighton and Hove Albion in this venture, and look forward to introducing our cutting-edge Aloft brand alongside one of the country's most exciting sports and leisure developments." Located adjacent to the new American Express Community Stadium, home of Brighton and Hove Albion Football Club, Aloft Brighton will form a key part of a new major development that includes a proposed specialist cancer treatment center underneath the hotel. The site also enjoys superb transport links, with an on-site mainline rail station and parking for 422 cars (including 27 disabled spaces), and is located within close proximity to Brighton city-center and its popular attractions. "As a global brand and leading hospitality company, Starwood's UK market expertise gives us confidence that this alliance will be a huge success," said Martin Perry, Brighton and Hove Albion Executive Director. "With its affordable price point, stylish design and accessible technology, the Aloft brand is the perfect choice for visitor accommodation at the American Express Community Stadium, appealing to multiple business segments including conference delegates, football supporters and visitors to the two Universities adjacent to the stadium." Delivering urban-influenced design and an energetic guest experience, Aloft Brighton will offer 150 loft-like guest rooms with ultra-comfortable plush platform beds, large walk-in showers and complimentary Bliss® amenities. The hotel will feature the brand's signature W XYZ SM bar, a buzzy public space where guests can mix and mingle, work or grab a drink with friends. Additionally, every Aloft hotel around the world offers live, free access to emerging artists and performances from some of the hottest local bands. 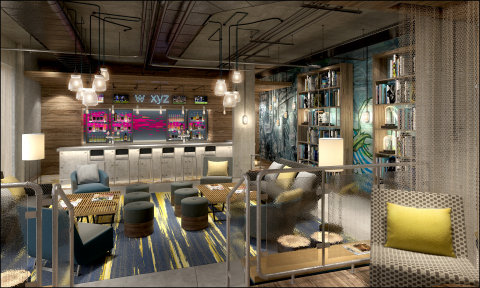 Designed with the needs of the savvy next-generation traveler in mind, Aloft Brighton will feature SPG Keyless—Starwood's industry-first keyless entry system that enables guests to use their smartphone or Apple watch as a room key—and fast and free Wi-Fi throughout the property. Hotel amenities will include an onsite restaurant; Aloft's signature Re:charge SM fitness center; 55 square meters of creative meeting space equipped with the latest audio-visual hardware; and Re:fuel SM by Aloft, a unique and convenient deli option for guests on the go, offering an array of food and drinks available 24 hours a day. Aloft Brighton will be managed by Interstate Europe's UK division, part of the leading global hotel management company, Interstate Hotels & Resorts, which also operates the 136-room Four Points by Sheraton in Kecskemet, Hungary. The signing of Aloft Brighton reaffirms the momentum behind the brand's fast-moving global expansion, with plans to introduce new properties in Europe from St. Petersburg to Kiev. Starwood also announced plans to open a second Aloft in London at the historic Tobacco Dock area in 2018—a dual-development hotel that will also feature the company's first Element property in the UK. "We are thrilled by the momentum gathering behind the Aloft brand, and its unstoppable appeal to owners and developers," said Felicity Black-Roberts, Senior Director Acquisition & Development, Starwood Hotels & Resorts, Europe, Africa & Middle East. "The brand's keen positioning towards the next generation of travelers continues to fuel its growth potential in emerging and mature markets such as the UK and beyond." Starwood currently offers 12 hotels in the UK and Ireland under seven of the company's 10 distinct lifestyle brands including: The Luxury Collection, Sheraton, Westin, W Hotels, Le Méridien, Tribute Portfolio and Aloft. With 100 hotels in 16 countries around the world, Starwood's Aloft brand delivers a fresh approach to the traditional staid hotel landscape. For today's (and tomorrow's) connected, curious and communal evolving global traveler, the Aloft brand offers a tech-forward, vibrant experience and a modern style that is different by design. For more information, please visit www.alofthotels.com/experience. Brighton & Hove Albion are Championship club in the Football League. The club plays at the state-of-the-art 30,750-capacity all-seater American Express Community Stadium, which opened in 2011. In 2014 they also moved into their new training facility and academy, the American Express Elite Football Performance Centre. The club's aim is to play at the top level of English football in the Premier League. For more information, please visit www.seagulls.co.uk.